I really love summer! My girls and I are trying to fit in as much as we can before school starts! My cute friend made a list and we are working together to accomplish everything on it before summer ends! 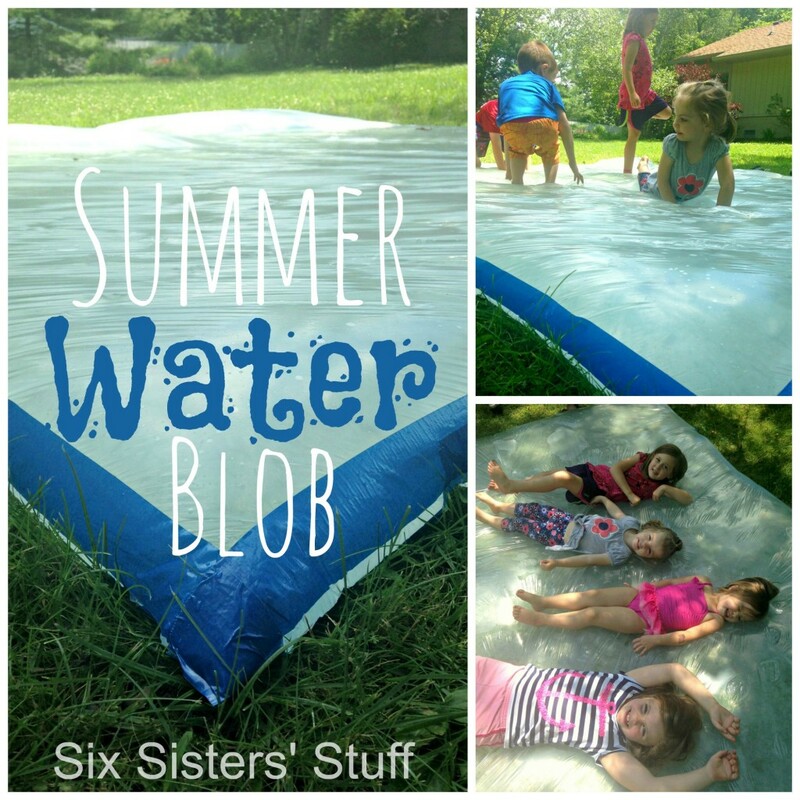 Last week we made a Giant Summer Water Blob and the kids loved it! Plastic Sheeting (we used a 10? x 25? sheet that was .4ml thick) You can find it at Lowes or any other hardware store. Spread out the tarp, then fold it in half. Fold the edges in twice and tape it. We folded and taped about 6 inches at a time. Leave a small hole for your hose in a corner after you have taped all three sides. Start filling up the blob! It will take awhile. It took ours about 30 minutes to fill up. Make sure your blob is on flat ground! Our Blob only lasted about 20 minutes before it started getting holes in it from little hands and feet. If I were to make it again I would get thicker plastic. The tape on the sides held up really well. We had no problems! I would try and tape the holes as they would come, but pretty soon I just let them go at it. It turned into a wet water blob and they kids loved it even more! Hope you have fun with the rest of the summer! A water bed balloon would work good too. Where would you get a water bed balloon? That would work great too! We did this a few times with the kids! They love it! Good idea to fold up the edges some, we will have to do that! I just love old fashioned play! Neat idea. My nephews would love this. I'm sending it on to my sisters (who are moms).